Raytheon is a name you may associate with turgid-sounding defense tech, but rarely anything that may rank as cool. This may change: It’s just unveiled its Scorpion helmet digital info tech, which may sound familiar to fans of Blue Thunder. 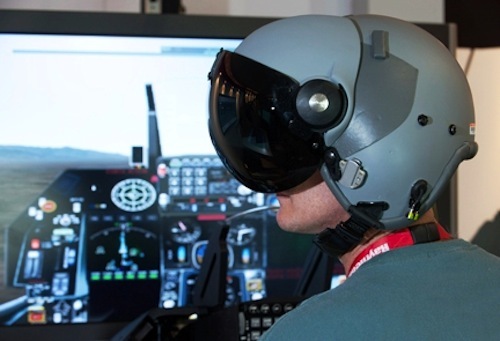 Scorpion isn’t a helmet by itself–it’s an insert to existing helmets that injects a huge chunk of 21st century wow factor into the business of flying a combat aircraft (which, lets face it, has quite a large wow factor all by itself). Designed to be cheaper to produce than complete all-helmet integrated solutions, Scorpion monocle attachments actually can be interchangeable, so pilots on duty can swap them with those off duty, which is another saving. See–21st century defense tech that’s cheap: Definitely cool. It’s definitely not short on tech though, despite this. 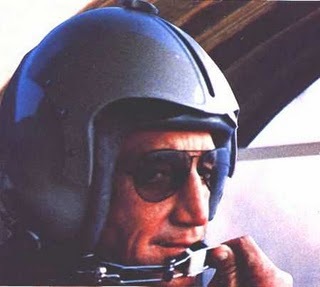 It fully integrates into the aircraft’s systems so that unlike conventional flying, where a pilot may have to swing the vehicle’s nose around to acquire a target through its built-in computer systems, while wearing Scorpion, the pilot can merely spin his or her head to acquire the lock visually–then the computer systems take over, and transfer the info to the weapons systems. A quick flick on the fire control, and it’s missiles away. There’s also assisted night vision, color-enhancement, and the usual array of digital avionics information that lets a pilot fly the aircraft without having to glance down at the cockpit display. Basically everything is designed to make it easier to fly a modern aircraft, and to reduce the time that pilots are distracted away from either important flying or combat decisions. It’s so good, in fact, that it’s just resulted in Raytheon beating out multinational competitors to re-equip F16 and A10 front line U.S. aircraft. Would Darth Vader be jealous of Scorpion? No: His helmet was crammed to the brim with electronics from the dark side of the future, mate. But suffice it to say that any Top Gun wearing a Scorpion who fell through a wormhole and found himself in that cantina in Mos Eisley spaceport wouldn’t necessarily feel he was out of place.